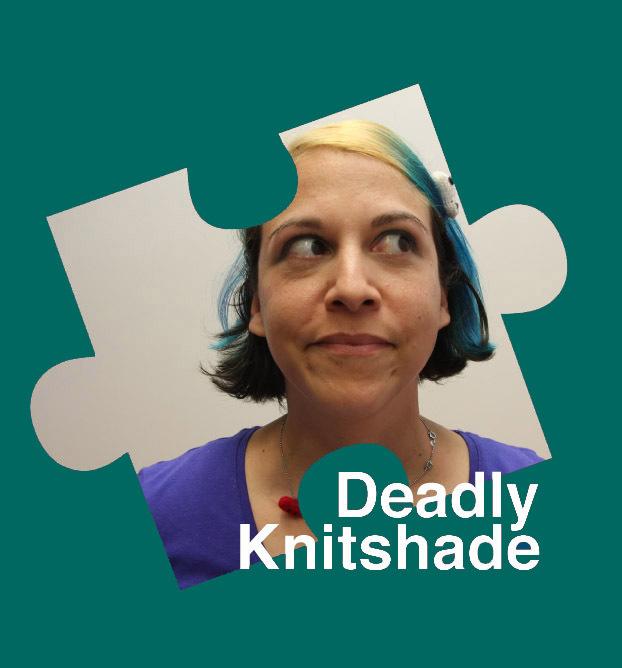 Joining us in our Crafivist Jigsaw #imapiece project is the incredible Deadly Knitshade aka Lauren O’Farrell (alongside Mr X Stitch and Hilary Pullen of Craft Blog UK). Lauren is an author, artist, and ‘woolly Godzilla wrangler’ based in London. She founded Stitch London, the UK’s largest stitching community with members in 52 countries worldwide, and pioneered the graffiti knitting movement in the UK with her yarnstorming collective Knit the City. She creates crafty art and writes books from her Fleece Station studio in Deptford, and has worked with countless charities since first picking her knitting needles in 2005. So what crafty shenanigans would we know you for Lauren? Knitting madness: I founded and run Stitch London, my woolly Godzilla of a stitching community, which I run on a voluntary basis. I also founded and run Knit the City, London’s graffiti knitting collective and pioneers of yarnstorming in the UK. I write books and make crafty art installations too. It is rumoured I never sleep. Why do you love craft? I love craft because I’m a storyteller and using my stitching to weave tales means you can wrap your stories around all sorts of things. I learned to knit while pitted in a fierce three-year battle against Hodgkin’s Lymphoma (a nasty blood cancer). My knitting needles were my attempt to distract myself from the needles they kept poking into my veins. I emerged from the battle, scared, slightly radioactive, victorious and instilled with eerie craft powers I now use for good. 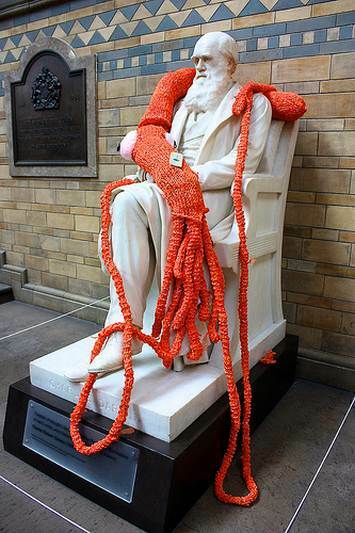 Plarchie (right) is my eight-metre handknitted giant squid. I conjured him from 160 plastic carrier bags for an event at London’s Natural History Museum. He’s been eating people and causing ten-tentacled chaos ever since. He’s even ended up with his own Twitter account (@plarchie). I apologise in advance for him eating anyone you care about. He’s a loose knitted squid cannon and I have very little control over him. Can you recommend someone who is doing craft work you admire and explain why? If I can’t pick anyone coming on this trip (they are all my heroes), then I’d say Betsy Greer (below). Betsy is billed as the mother of ‘craftivism’ and wrote the book ‘Knitting for Good’. Her work first made me realise that the voice I had with my own crafty art was actually louder than I thought. She’s an inspiring lady and awfully nice too. What you love about craftivism? As I have said above I love that craft can tell stories in unconventional ways. Craftivism gets to people where they least expect it. It reminds you of being a kid or of your granny stitching in the kitchen and then suggests you think harder about important issues. It’s not shouty or angry or preachy. It’s amazingly strong because of that. Why did you decide to get involved in this Save The Children campaign Race Against Hunger? I decided to get involved with the I’m a Piece project because ever since I beat cancer I’ve had this overwhelming urge to help save the world in as many ways as I can. The world is a wondrous place and we should all get the chance to love living in it. This project lets me help tell stories of the amazing and inspiring kids there are in the world, making their way through some tough situations and winning. If we can help them grow up to be the brilliant people they are on their way to being then how can we not? “A life lived in fear is a life half lived” I stole the phrase from the dancing rom-com Strictly Ballroom, but it’s a powerful one. It reminds me that if I’m going to really live my life like I mean it then fear isn’t an option. Whether that’s standing up and saying something others are too afraid to say out loud , or travelling to a strange country and seeking out stories that are likely to break your heart a bit. It’s all about being brave enough to make life worth living. And also if you can lessen the fear in someone else’s life you should. Help them be brave. For my other two pieces I haven’t quite decided yet. I was hoping to borrow a phrase or two I find on our trip and give someone else’s words a bit of immortality. Stitch London, my woolly Godzilla of a stitching community, will be gathering for a I’m a Piece Stitch Up. We’ll make our jigsaw pieces and untangle the ways we can help make the world a woollier and more wondrous place for everyone. The Excellent Exploits of Mr X Stitch – Get crafty with the #imapiece campaign!